For other people named Charlie Strong, see Charlie Strong (disambiguation). Charles Rene Strong (born August 2, 1960) is an American football coach and former player. Strong held numerous assistant coaching positions before becoming a head coach of the University of Louisville Cardinals in 2010. During his four-year stint at Louisville, he led the Cardinals to a 37–15 record and reached a bowl game each season, including the 2013 Sugar Bowl. After the 2013 season he left Louisville to become the head coach at the University of Texas Longhorns. He was fired by the Longhorns after the 2016 season with a 16–21 record in three seasons. Charles Rene Strong was born in Batesville, Arkansas, one of six children of mother Delois Ramsey. Strong's father, also named Charles Strong, was a teacher and coach in Luxora, Arkansas and never married Ramsey. The younger Strong grew up in a blended household with his aunt and aunt's six children. After lettering for four years (1980–1983) as a defensive back at the University of Central Arkansas, Strong joined the University of Florida coaching staff as a graduate assistant in 1983. He later served as a graduate assistant at Texas A&M in 1985. He received a master's degree from Henderson State University and also received a master's degree and education specialist degree from the University of Florida. He is a member of Phi Beta Sigma fraternity. Strong's first full-time coaching job was at Southern Illinois in 1986, where he coached wide receivers. He later assumed defensive coaching duties at Florida, Ole Miss, and Notre Dame. In 1999, Strong joined the South Carolina Gamecocks as defensive coordinator. His stifling defenses and charismatic personality created buzz that he would be possibly the first black head coach in the SEC, but job offers were slim. Sylvester Croom eventually broke the color barrier in the SEC coaching ranks in 2004. Strong was hired as defensive coordinator for the Florida Gators before the 2003 season. Florida head coach Ron Zook was fired midway through the Gators' 2004 season, but continued to coach until the bowl game; Strong served as interim coach of the Gators for one game, the December 2004 Peach Bowl. Florida lost the game, 27–10, to Miami. When Urban Meyer was hired as Florida's head coach, Strong was the only assistant coach retained from Zook's staff. In a January 2009 interview with the Orlando Sentinel, Strong expressed his belief that race played a large part in the reason that he hadn't been offered a head coaching job in 2009. Strong, whose wife is white, especially cited prospective employers' discomfort with his interracial marriage. Strong was a 2009 finalist for the Broyles Award, given annually to the nation's top assistant coach. He became the 21st head football coach at the University of Louisville on December 9, 2009. In a telephone interview that day with ESPN.com columnist Pat Forde, former Indianapolis Colts head coach Tony Dungy, himself African-American, said of Strong, "When they see what he can do, you're probably going to have a lot of people disappointed they didn't hire him sooner." Strong led Louisville to a victory in the 2013 Sugar Bowl over his former team, the Florida Gators, by a final score of 33–23. It was the biggest upset victory in terms of point spread in any BCS bowl game since the inception of the BCS in 1998, as Florida entered the game favored by almost two touchdowns. On January 23, 2013, Strong was given a $1.4 million raise which brought his annual compensation to $3.7 million and raised his buyout to $5 million. At the time it made him 7th highest paid active coach in college football and highest paid coach outside the SEC, Big 12, and Big Ten conferences. 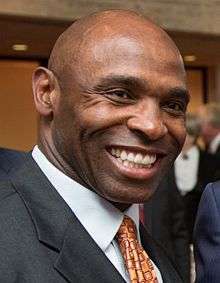 On January 5, 2014, the University of Texas announced that Strong would be leaving the University of Louisville to accept the head football coach position at Texas to replace Mack Brown. Strong's 5-year contract is worth $5 million annually. He was formally introduced as Texas' 29th head coach the next day and became the first black head coach of the Texas football program. UT Athletic Director Steve Patterson and UT President Bill Powers stated their reasons for hiring Strong for the head coaching position was due to Strong's commitment to the tradition of the UT Football program as well as the development of the student-athletes. Strong discussed his devotion to his athletes in his first press conference as the head coach of Texas, "I want to see [the players] develop on the field as well as off the field...The program is always going to be about physical and mental toughness." In his first training camp as Longhorns coach, Strong suspended or dismissed a number of players for legal and disciplinary reasons. Players went to training camp with blank white helmets and Strong said they would have to earn the right to have the Longhorn logo on them. Texas under Strong started 2-4, which included a 20-17 nail biter defeat to #12 UCLA and 31-26 close loss to #11 Oklahoma. The Longhorns rallied and finished 6-6, which included an upset win at home versus #23 West Virginia, 33-16, and a 48-45 shootout home win against Iowa State, Strong's first shootout win in the Big 12. A 41–7 loss to BYU at home, 28–7 loss to #7 Baylor at home, 23-0 shutout by #10 Kansas State in Manhattan, and a 48-10 home loss to #5 TCU proved to be blemishes to Strong's first season in Austin. Under Strong, the Longhorns earned a bowl bid in his first season. On renewing an old Southwest Conference rivalry, playing against Arkansas in the Advocare V100 Texas Bowl in Houston, Strong commented, "I grew up in Arkansas, grew up an Arkansas fan because it's a major university in the state," Strong said. "So many memorable games. Like I said, the '69 game was an unbelievable game. Growing up around it, you just know how big it was and how important it is to so many people." Texas lost the game by a score of 31-7. In 2015, Strong's coaching staff got a top-10, recruiting class, competing with rivals Texas A&M, Baylor, Texas Tech and TCU in in-state recruiting. And during the spring, the coaches switched the offense to a spread offense, as the quarterbacks Strong recruits are used to this style since it is extensively used in high school, Strong noted. Strong's first upset win against a top 10 team at Texas was in the Red River Showdown in his second year, beating Oklahoma 24-17. Strong had begun the season 1-4, and coming into the game, the Longhorns program was noted by multiple national media outlets as being in trouble. The Longhorns dominated the rushing attack with 313 yards on the ground and had two players rush for over 100 yards in the game. Both players (QB Jerrod Heard and RB D'Onta Foreman) were in their second years, signalling the success of Strong's recruiting at Texas. After the victory, the players picked up Strong and crowd-surfed him in the middle of the field, then Strong posed for photos wearing the Golden Hat. Texas would finish 5-7, not eligible for a bowl game, but ended the season on a high note upsetting No. 12 Baylor. The offseason saw Strong bring in another offensive coordinator in Sterlin Gilbert from Tulsa, and a top-10 recruiting class. Texas started their 2016 campaign against Notre Dame at home, starting freshman QB Shane Buechelle, but it was Tyrone Swoopes getting Texas the game winning touchdown, upsetting No. 10 Notre Dame in 2OT. In the following AP poll, Texas was ranked for the first time under Strong, at No. 11. 1 2 Bragg, Roy (January 12, 2014). "UT's new coach Strong comes from humble beginnings". San Antonio Express-News. Retrieved August 29, 2014. ↑ Chris Low, "Croom's legacy continuing to open doors," ESPN (January 20, 2014). Retrieved September 30, 2014. ↑ "Florida Coach Charlie Strong Believes that Race Affected Opportunities," Sports Illustrated (January 6, 2009). ↑ "Florida assistant Strong heading to Louisville – ESPN". Sports.espn.go.com. December 11, 2009. Retrieved January 15, 2014. ↑ "Charlie Strong and Louisville Cardinals are glad he stayed – college football – ESPN". Espn.go.com. January 3, 2013. Retrieved January 15, 2014. ↑ Louisville Courier-Journal 4:55 p.m. EST January 23, 2013 (January 23, 2013). "Charlie Strong's $1.4M raise makes him among highest-paid coaches". Usatoday.com. Retrieved January 15, 2014. ↑ USATODAY July 1, 2013 (July 1, 2013). "USA TODAY Sports college football coaches salaries database". Usatoday.com. Retrieved January 15, 2014. ↑ "Charlie Strong Named Texas Head Football Coach | News". Utexas.edu. January 9, 2014. Retrieved January 15, 2014. ↑ Pete Thamel (January 4, 2014). "Texas, Charlie Strong in negotiations for Longhorns' coaching job - College Football - Pete Thamel - SI.com". Sportsillustrated.cnn.com. Retrieved January 15, 2014. ↑ Solomon, Jerome (January 6, 2014). "With Strong's hire, UT peels away prejudice a layer at a time". Houston Chronicle. Retrieved April 21, 2015. 1 2 Madden, Ted (January 6, 2014). "UT introduces Charlie Strong as new Longhorns coach | kvue.com Austin". Kvue.com. Retrieved January 15, 2014. ↑ "Playing for Strong, Texas pulls off signature win at Cotton Bowl". Horns247. Retrieved 2015-10-12. ↑ "Sorry, Charlie: TCU rout fuels notion that Strong is in danger at Texas". CBSSports.com. Retrieved 2015-10-12. ↑ "Charlie Strong wears Golden Hat, Texas players throw coach in air after upset of Oklahoma". www.dallasnews.com. Retrieved 2015-10-12. ↑ "Source: UT decides to fire Strong after 3 seasons". USA Today. Retrieved 2016-11-26.